The quTAU system can be used to transfer the time tags of registered events with picosecond (ps) precision and at high rates to a PC. Additionally, it can count single and multiple channel coincident events at even higher rates internally and convey those to a PC. 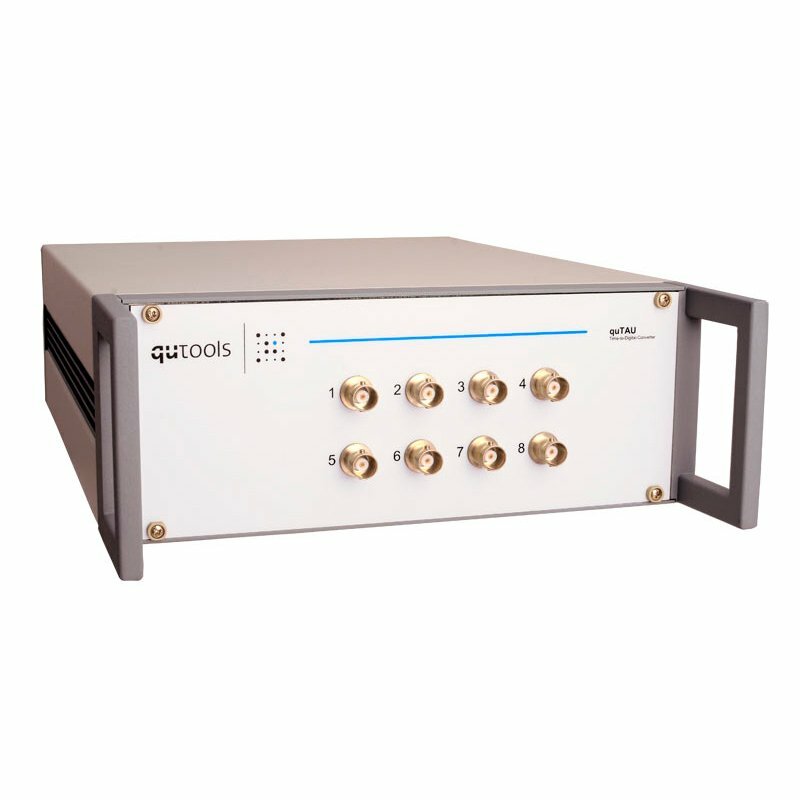 As a standard time-to-digital converter (TDC), quTAU registers incoming signal events on 8 independent channels, records their exact time (bin size 81 ps) and channel number and communicates these to a PC. A graphical user interface is supplied for Windows and Linux, software examples are available for C/C++ (Windows and Linux) and LabVIEW. For some applications it is not important to know the absolute time of its occurrence, but only whether or not it appeared within a short timing window (the so-called coincidence window) around an event at another channel. For this purpose the user can set a coincidence timing window and then the quTAU counts events that happen individually or coincident with another event for the different combinations of channels (4 channels are used for this purpose). Because of the reduced amount of data, this mode can handle significantly higher event rates. Input Hardware Extension: The input extension widens the range of signals able to be processed with regard to signal levels and maximum rate. Adjustable threshold comparators at each channel allow the quTAU (H+) to process NIM and user defined signals as well as (LV)TTL. One channel additionally features a divider so that high frequency periodic signals can be used as triggers. Lifetime Software Extension: This software add-on enables the user to analyze lifetime measurements on the fly. Together with the input hardware extension, high frequency trigger signals can be used. The software calculates the required histograms, fits exponential decreases and takes response functions of the system into account. HBT Software Extension: This software extension is intended for Hanbury-Brown Twiss experiments. It calculates the g(2)(τ) function from the detection times of two inputs. Standard functions can be fitted to assess the relevant parameters.